Good morning. 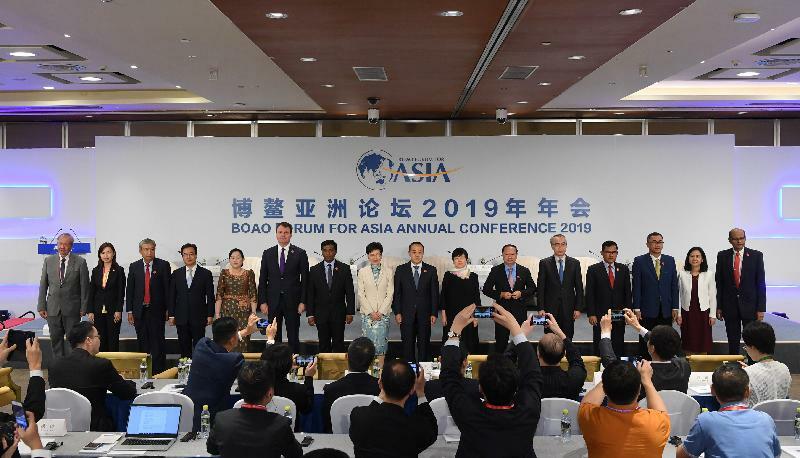 It gives me great pleasure to be here for this year's Boao Forum for Asia and to take part in today's session, the "ASEAN-China Governors/ Mayors' Dialogue." This is a welcome opportunity for me to share with you the pivotal role Hong Kong is privileged to play in strengthening connections between Mainland China and ASEAN. Let me first say that as a special administrative region of the People's Republic of China under "One Country, Two Systems", Hong Kong enjoys a high degree of autonomy in a wide range of matters, including "external affairs" enshrined in eight important articles in the Basic Law. Specifically, Article 151 permits Hong Kong to maintain and develop relations and conclude and implement agreements with foreign states and regions and relevant international organisations in the appropriate fields, including the economic, trade, financial, monetary, shipping, communications, tourism, cultural and sports sectors. Recognising the economic growth potential and the boundless promise of ASEAN, my Government has spared no effort in furthering our relationship with the ten member nations of ASEAN. As a matter of fact, ASEAN as a trading bloc has already emerged to become Hong Kong's second largest merchandise trading partner, just behind Mainland China. Last year, our bilateral trade in goods amounted to some US$130 billion, representing an impressive increase of 14.2 per cent over 2017. And among the 8 700 Mainland and international companies that have a presence in Hong Kong, nearly 600 of those are ASEAN companies. I believe that there is still a lot of potential for growth. That's why I was in Bangkok just last month to open a new Hong Kong Economic and Trade Office (ETO) – our 13th overseas office and our third among ASEAN member states, after Singapore and Jakarta. The new Bangkok ETO will work to further boost our economic ties with ASEAN. So, too, will the Free Trade Agreement (FTA) and Investment Agreement we signed with ASEAN in November 2017. So far, ratifications of the ASEAN member states are in good progress. ASEAN companies will enjoy unimpeded trade and investment flow. We do hope to go further by joining the Regional Comprehensive Economic Partnership (RCEP) which brings together ASEAN and six of its FTA partners. Our accession would help build a bigger economic pie for the region and create a win-win situation for all the parties involved. As a matter of fact, in anticipation of a closer relationship between Hong Kong and ASEAN, I have travelled to seven of the ten member nations of ASEAN meeting heads of states. The remaining three are the Philippines, Cambodia and Laos. I look forward to visiting these countries in due course. According to the United Nations, in 2017, Hong Kong was the third largest direct investment destination and fifth largest source of direct investment. As at end 2017, ASEAN accounted for 4.1 per cent of inward direct investment into Hong Kong with a stock of over HK$600 billion, and 3.1 per cent of outward direct investment from Hong Kong with a stock of over HK$400 billion. Obviously, our bilateral investment is vigorous. ASEAN's huge infrastructural investment together with its fast expanding economy will generate enormous potential for Hong Kong companies for the years to come. We will facilitate Hong Kong companies investing abroad and bringing along our professionals to serve the projects. Apart from the FTA and Investment Agreement, the Belt and Road Initiative will also bring Mainland China, ASEAN, Hong Kong and many other countries and regions together in this 21st century of opportunity. ASEAN members are important Belt and Road economies, and are well positioned to reap the benefits brought by the visionary Initiative. In this connection, Hong Kong has a world-class financial and professional services sector, which includes bankers and lawyers, accountants, risk managers, marketing and communications specialists and many more. They can bring expertise to bear in everything from project design and planning to construction, operation and management. 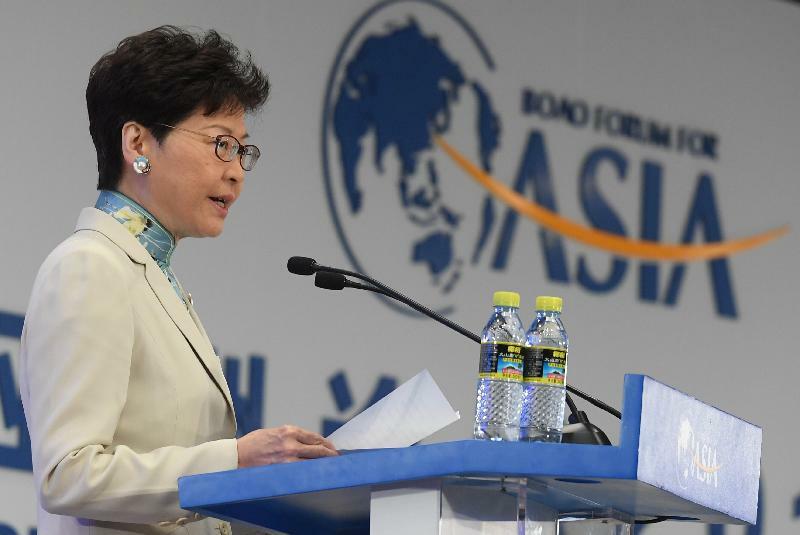 In short, Hong Kong will be the perfect partner for ASEAN on Belt and Road projects. Beyond business, Hong Kong is also eager to strengthen our people-to-people bonds with other economies including ASEAN, which is one of the key objectives under the Belt and Road Initiative. In this regard, we look forward to expanding academic and youth exchanges, and are prepared to share our experience in city management, anti-corruption, promotion of equal opportunities and many other aspects with our ASEAN friends. To conclude, ladies and gentlemen, Hong Kong has played the unique role of a strategic gateway and important hub for the reform and opening up of China over the past 40 years. Hong Kong will continue to play that role as our country goes forward, and we look forward to make a contribution to the ever-deepening ties between China and ASEAN. As we are right now in Hainan, I just want to say that we'd love to also play an important role in the continuous development of the Hainan economy. I wish you all a rewarding day at the Boao Forum for Asia. Thank you very much.